The first full Mercury Retrograde cycle of 2017 begins with the Pre-Shadow on March 27 at 4:48 am UTC*. 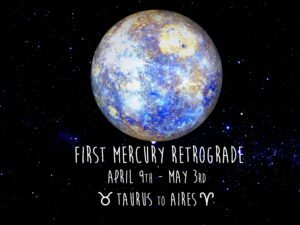 Mercury Retrograde Station occurs at 11:14 pm UTC, on April 9, in Taurus (4o 51″) Mercury goes direct on May 3 at 4:22 pm UTC, in Aries (24o 16″) Mercury leaves the Post-Shadow on May 21 at 12:58 am UTC. Please note that all times are approximate. The actual times are defined by the observer location and vary due to parallax. * Coordinated Universal Time (UTC) replaced Greenwich Mean Time in 1961. They are often used interchangeably. Hello I’m Paul (aka) PJ I’m currently in jail and I just recently started studying wicca. I’ve read two introductory books by Scott Cunningham. I’m still lost is there anyone willing to mail me any information and/or letters to help me out I guess I could say I need a teacher I’m still lost please help please and thank you.